Barcelona, Spain. September 1, 2015: ExoClick, the innovative ad network, today announced that it has been named as a National Champion for Spain in The European Business Awards, a prestigious annual competition supported by businesses leaders, academics, media and political representatives from across Europe. Now in their 9th year, The European Business Awards selected 678 companies from over 32,000 entries from businesses in 33 European countries to be named today as National Champions. ExoClick will now go forward to compete for the category title of ‘The Business of the Year Award: Turnover €26-150m’ to be selected by a group of prestigious judges which in the past has included the IMF’s Christine Lagarde and former EU Trade Commissioner Karel De Gucht. A full list of this year’s judges can be viewed here. The next round requires the National Champions to make a presentation video, telling their unique story and explaining their business success. The judges will view all of the National Champions’ videos and award the best of this group the coveted ‘Ruban d’Honneur’ status. Ruban d’Honneur recipients will then go on to be part of the grand final in 2016. For further information about the awards and the list of selected National Champions click here. The European Business Awards was created to support the development of a stronger and more successful business community throughout Europe. 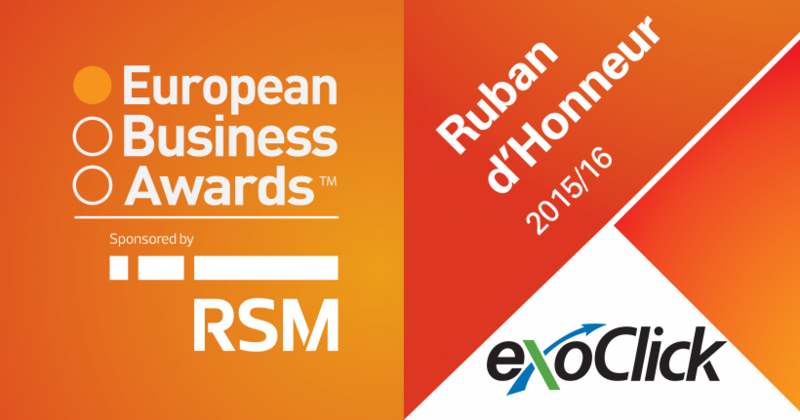 The European Business Awards have been supported since their inception by lead sponsor and promoter RSM, the seventh largest audit, tax and advisory network worldwide with a major presence across Europe.